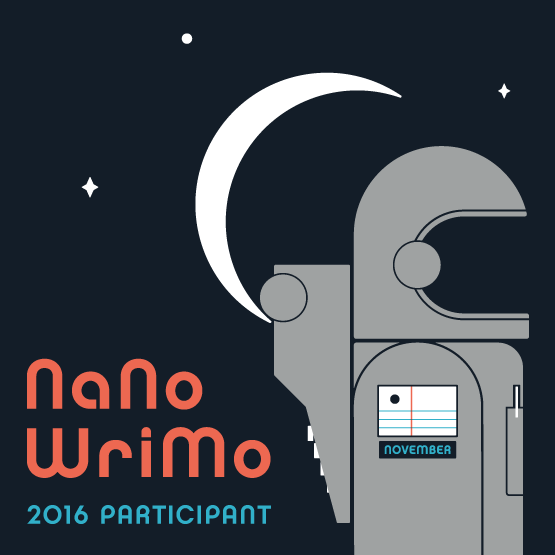 On October 28 I decided, completely on a whim, that I was going to participate in NaNoWriMo (National Novel Writing Month). The goal of NaNoWriMo is to write a 50,000 word novel by the end of the month, which translates into about 1,667 words a day. I thought I would use the month to finish the novel I started writing years ago (well, one of the novels I’ve started), but I decided on November 1 that I was going to start completely from scratch. I signed up for the official website, filled out my profile and quickly earned some badges. (Apparently, people like me who write with no outline are called “pantsers”. As in flying by the seat of your pants? Perhaps.) The day I signed up, I decided on a name and a loose plot. I thought of names for my main characters. Then I just started writing. I didn’t think ahead, I didn’t question what I was writing. However, I realized quickly that my plot sounded like a mixture of “Mr. Robot” and “Law & Order: SVU”, but I haven’t decided if that’s a good or bad thing (although one Twitter follower said it sounded awesome, which I appreciate). As of the end of November 6, I have written 10,226 words. I looked back at the last draft of my first novel, and I had written only 7,000 over four or five years. So I’m already doing leaps and bounds better than I have in the past. If I keep working at the pace I have been this past week, I might actually crack the 50,000 mark. Does that mean the book will actually be finished at that point? Probably not. But it would still be a major accomplishment. Even if I don’t make it to 50,000, or even if I do and this novel just sits on my laptop and collects digital dust, at least I’ll be able to say I tried and did my best. And I think that matters more than whether or not the novel actually gets published — although that would be nice. I think the most important thing for me to keep in mind is that this is a learning process. If I attempt NaNoWriMo again next year, maybe I’ll use an outline instead. Maybe I’ll shoot for more than the minimum word count to preempt any days where I can’t or don’t write. Heck, I might even attend a write-in. 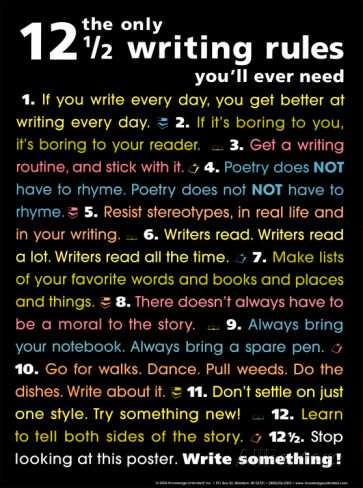 As I write, I am reminded of a poster about writing rules I bought in college. The first rule is, “If you write every day, you get better at writing everyday.” So with that in mind, I should probably get back to work – this novel isn’t going to write itself. If you want to cheer me on or offer some words of encouragement, feel free to do so in the comments or on Twitter! Tagged NaNoWriMo, National Novel Writing Month.